OASE AquaMax Eco Expert pumps offer higher turnover flow rates for large pond filtration and water cascades. OASE Germany have produced the cutting-edge range or AquaMax Eco Expert pumps for large ponds, streams, waterfalls and pond filter systems in demanding applications. The Eco Expert pumps supersede the OASE ProfiMax and deliver similar performance at much reduced power consumption rates. 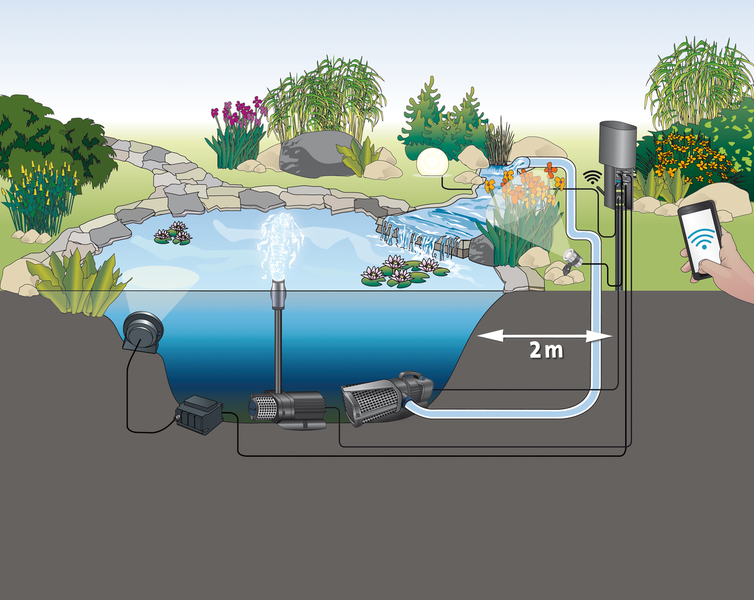 Flow rates range from 21,000 Litres/Hour up to 44,000 Litres/Hour and are designed to move clean, dirty or turbid water of up to 11mm diameter solids to either a suitable pond filter or to create impressive water features. 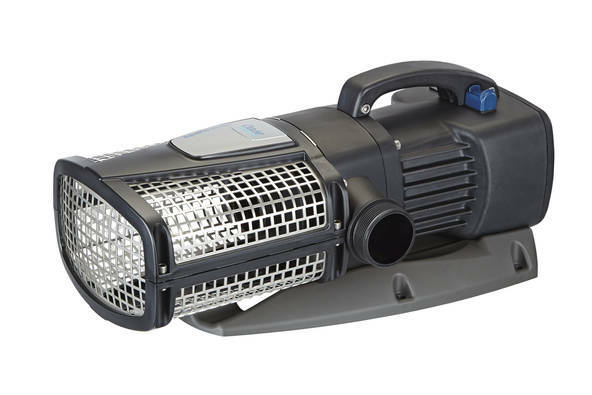 The AquaMax Eco Expert 20000/12V is also available for use in swimming ponds and pools which cannot accept 230v mains electricity directly in the pool. Heavy duty, high flow, solids-handling powerhouses. OASE AquaMax Eco Expert pumps are solid, stable, high-performance pumps designed for continuous operation in clean or soiled water. 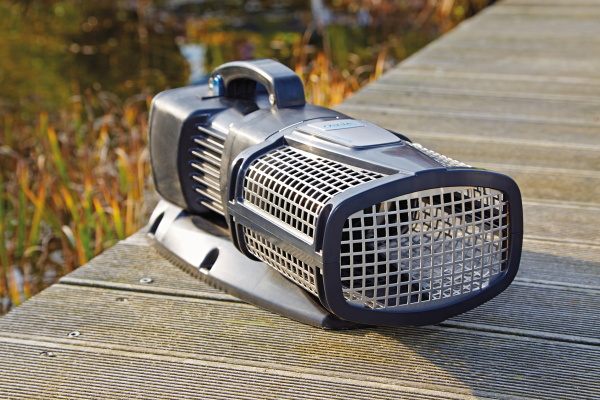 These pumps are ideal for filtration systems on large fish ponds and water supply to large waterfall/stream water features which require a higher flow rate or delivery height. AquaMax Eco Expert pumps are fitted with a robust rotor and a large stainless steel front strainer with 11mm mesh gauze, allowing organic waste particles to be processed and passed. These pumps are very energy efficient due to the OASE Eco Plus motors, delivering exceptional performance for the energy consumed. These units are also ‘Easy Garden Control’ compatible, meaning an EGC device can be connected to the pump, allowing for flow rate and function control to be set remotely via a panel or a smart device (smartphone or tablet) via the OASE App. Compatible EGC control devices also provide information on the pump operation and status, such as motor rotational speed and current power consumption. Such control devices include the OASE FM Master EGC Cloud and EGC Control Cloud as well as the Eco Pump Control for panel-based control. The optional EGC controller will give live operational feedback to the user total run time and specific error messages such as impeller stall. Up to 10 Eco Expert pumps can be daisy-chained together and individually controlled if desired. All models in this range feature Environmental Function Control which prevents overheating in the case of pumping without water. All models also feature the optional Seasonal Flow Control which can be engaged to reduce the pumping rate and subsequent power consumption by 30% automatically in cold water temperatures. These pumps are frost-protected to temperatures as low as -20˚ Celsius. The AquaMax Eco Expert pump can be installed underwater and has a conveniently placed lifting handle for easy movement. These pump can also be installed dry in a flooded suction scenario and are very quiet running in this situation. The large side outlet allows for connection of 38mm-50mm inner diameter hose pipes. 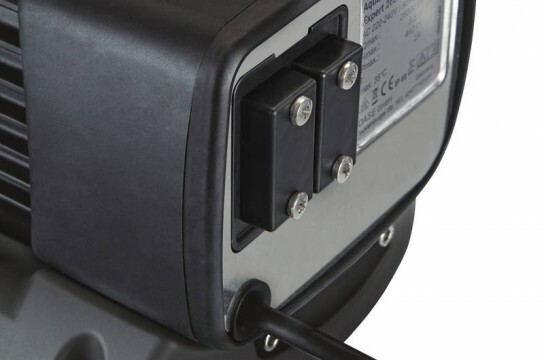 All standard AquaMax Eco Expert units are supplied with 10 metres of power cable. The 12 volt 20000 model has 8 metres of low voltage cable and a further 2.5 metres of main cable on the weatherproof transformer. All AquaMax Eco Expert pump carry the lengthiest OASE Guarantee of 3 years standard with a 2 year extension upon registering the purchase with OASE.